I’ve never flossed and then later thought to myself, “I wished I hadn’t done that.” I’ve never worked out and then regretted it. I’ve never read a book and then thought it was a waste of time. Anytime we take an intentional effort to improve an aspect of our lives, we don’t regret it. We might regret that we didn’t start sooner or continue down the disciplined path, but we never grieve having taken the good action. I assure you that if you and your significant other will join me in the month of February for the 28-Day Marriage Challenge, you will not regret it. During the month of February, I’m asking couples to give me less than two minutes a day. Preferably some of the first two minutes of their day. 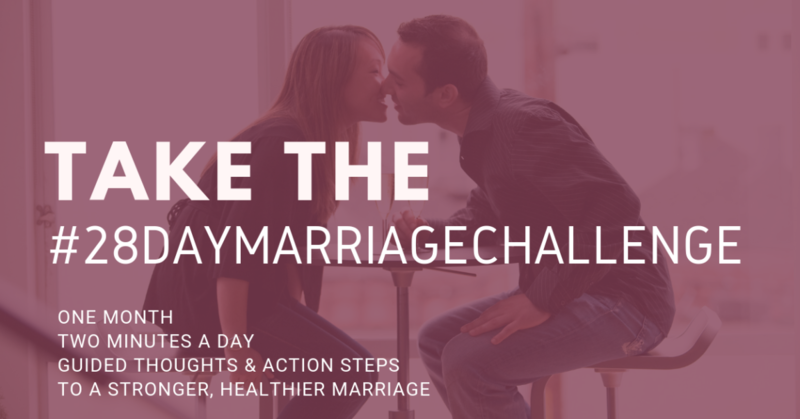 Starting February 1, Jenny and I are starting the 28-Day Marriage Challenge. We are asking couples to take two minutes every day to read a very simple email. That’s it. Nothing fancy. Nothing earth-shattering. Just one good idea to get you thinking about your marriage and ways to strengthen your relationship for that day. For some, this process seems far too simple to make any difference, but those are the people who have never followed through in an activity like this. Others, who have been there, know the power of discipline and how a very small action can create a very big change if someone will just stick to it. This prayer doesn’t imply you don’t already love your spouse, but who couldn’t benefit from loving their spouse more? Repeat this prayer every day between now and February 1st. Several years ago I started working out. I had started many times before, but always quit. What changed this time? I had a partner. For three years we have worked out together. If it were not for my partner, I would have quit. Hopefully, you and your spouse will do this challenge together. That will give you a built-in partner to keep you engaged. But don’t stop there. Invite others to join you and your spouse for this month. Encourage your friends, family, small group members, or Sunday School class to sign up. Simply share this post, tell people you are in, and invite them to join the challenge with you. Then ask him every morning to reveal Himself to you. Rob if you will put out an honest effort to seek Him…He will speak to your heart! Thank Him for everything..the beautiful sunrise, that you have a roof over your head, the sweet exchange that you witnessed at the store…everything. Tell Him that you’re sorry if you do something that bothers you. Talk to Him like a friend in all things. You will begin a relationship that will touch your heart and soul! You will know without a doubt! If you will do these simple things then I am very excited to see where He leads you 🙂 Start right now? I hope that you will! Looking forward to starting this! I feel SO Blessed to be included, THANK U! I filled in the blanks, hit SUBMIT, but nothing happened. Did it go through? Caught this on a WhatsApp marrieds group. Had to check it out. Thank you. I can’t wait to get started. Am all for flourishing marriages. Let’s do this. So looking forward to a better 2019 and refreshed marriage. Not sure if it came though, I clicked subscribe, for me and my husband. Love this idea – WTG, Kevin! Excited about it. Looking forward to the opportunity and shared with some friends. Thanks KT for your willingness to guide. God is real. Just believe. How else can a human being be created, but by some supreme being. I am so much excited. Looking forward for this challenge. Excited about this challenge! So glad my wife agreed to do this also! I signed up for this challenge but did not receive anything today. Did you receive my information? I signed up for this challenge but I did not receive an email on February 1st. Long story short, in the end, he said yes. Is it possible for you to send me the information from February 1st? I received the one for February 2nd and 3rd but would like to read the one from the 1st. Thank you for this challenge. I really appreciate your insight on things. I just found this website. Guess I missed the challenge. Any way I can get the 28 days, one day at a time to my inbox? You can still sign up now to get the second half. After February ends, we will switch the emails to where they are accessible.